Hans Sauter (1933 – 2018) (PE nr. 1092 – 2018/06) | M.Afr. On Thursday 25th January 2018, the Lord called Hans Sauter home after 37 years of missionary work in Rwanda and almost 30 years in different jobs in Germany. 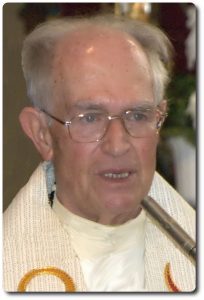 He was ordained at Geislingen on the 9th July 1960 and the way was open for his commitment to Rwanda in Central Africa. First of all, he learnt the language of the country, Kinyarwanda, and then went to the south of the country to work in the Diocese of Butare. He was to stay there until his return to Germany in 1988. In Africa, he was put in charge of pastoral work in different parishes. He worked for a number of years in the parishes of Cyanika, Nyanza and Nyamiyaga. In 1975, Bishop Gahamanyi entrusted him with the task of Diocesan Treasurer. It was a big and difficult task which he stuck at for four and half years. In September 1979, he was able to follow the Session/Retreat in Jerusalem. For two and half months he was able to refresh himself spiritually in the community with other missionaries and to tap into new strength. Already in 1972, he had to return to Riedlingen in Germany for treatment for hepatitis and later on, he would have to receive medical treatment on a regular basis. However, that did not prevent him from being on hand for the service of the Church in Rwanda. When Hans had to return definitively to Germany in 1988, he took up an appointment first of all as superior in Haigerloch not only being responsible for the community but also for pastoral work in the neighbouring parishes. Then he went to Cologne in 1993 to work in the office of the Provincial Treasurer. He often suffered health problems. In 2001, he returned to Haigerloch in order to continue rendering service to the community and in pastoral work. He finally retired in 2008. Patiently Hans gave himself little by little to the Lord as was expected of him being the trustworthy and modest confrere with whom everyone could get along.